USCIS is finally starting to update its Immigration & Citizenship Data page with data for petitions processed in FY2018 Q4 (July to September 2018). As usual, I’ve made charts to highlight salient features. I like to look at annual trends in receipts and adjudications, because this reflects demand and allows understanding and predicting processing times at the Investor Program Office. The backlog of pending petitions grows and processing times increase when IPO receives more petitions in a year than it can process in a year. That happened for I-526 from 2010 to 2017, when IPO finally started to catch up. In 2018, IPO surged ahead, processing more than twice the number of I-526 received. 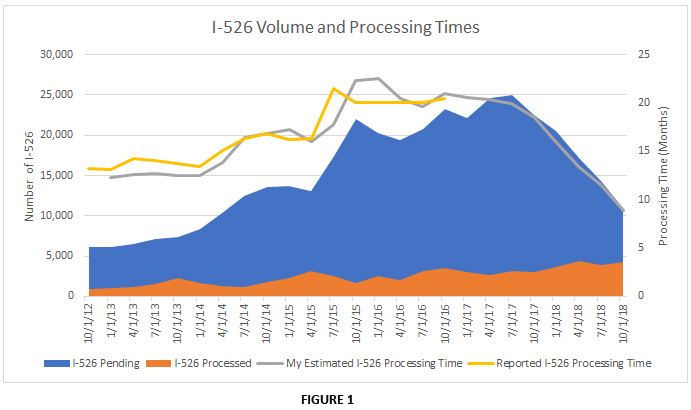 At this rate, the entire backlog of I-526 pending as of year-end 2018 will be adjudicated in 2019, and new I-526 can expect processing times of less than one year. I-526 processing times were a major factor for people who filed during peak demand in 2015 and 2016, and thus faced years-long processing on average. I-526 processing times will fade as a consideration, as new petitioners can expect months-long waits on average. (My I-526 prediction spreadsheet forecasts future processing times from petition volume.) Meanwhile, I-829 faces continued long processing times because adjudication volume is so small compared to the backlog. So long as IPO can only process less than 3,000 I-829 in one year, it will take 2-3 years just to get through the backlog of 7,660 I-829 pending as of October 2018. But we hope to see I-829 volumes improve considerably in 2019. IPO’s total output was about the same in FY2018 Q4 as in Q3, just with a few more I-829 processed at the expense of a few fewer I-526. Meanwhile, the number of forms received by IPO remained relatively low in Q4. There was a small I-526 surge in advance of the September 30, 2018 regional center program sunset date, but nothing like in previous years. There continue to be very few new regional center applications and amendments, and high denial rates for previously-filed I-924. 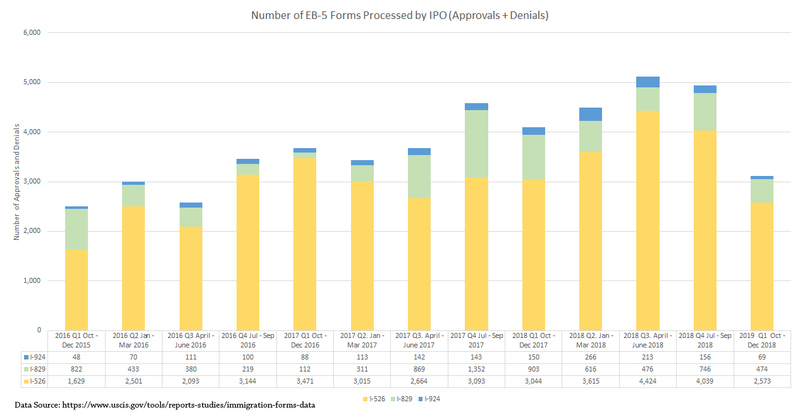 EB-5 in the early 2000s used relatively few visa numbers overall, and only really took off with the increase of EB-5 interest from/in China after 2008. Then China-born investors drove growth and claimed a majority of visas until the total number of EB-5 visas possible to issue hit its ceiling: the annual quota of about 10,000 visas. Since that ceiling was reached in FY2014, there’s been no room for EB-5 to grow — China and the rest of the world just have to jockey each other for the available annual visas. The decreasing number of EB-5 visas issued to China-born applicants since 2014 does not primarily reflect decreasing demand from China (China still dominates the backlog), but increasing demand from other countries that decrease the number of visas available to China. FY2018 data shows a marked increase not only in total number of applicants from outside China, but also in the number of countries supplying those applicants, and in the number of countries with a relatively large number of applicants each. EB-5 marketers care about this, because it helps identify the range and depth of market potential outside of China. Past China-born investors care about this, because their future wait times depend on the nature of incoming non-China demand (with best case scenario being demand concentrated in a few countries that will become blocked by the per-country cap, and worst case being large total demand spread out over many countries). The Visa Office report indicates the number of green cards issued for conditional permanent residence. To track visa numbers back to investor detail, it’s necessary to factor in the time between investment and visa issuance (about 1 to 5 years in 2018 depending on investor origin and I-526 processing time), and the number of visas per investor (about 3 on average). The Visa Office report only directly reflects demand for countries that take significantly less than 700 visas (ie less than the 7% per-country cap). For countries that exceed the cap, the number of visas issued is not the number they demanded, but the number they could get. In FY2018, Vietnam got 7% of total EB-5 visas pursuant to the per-country cap, regardless of how many Vietnamese were ready to apply, and China got 48% of visas because that’s what was left for the oldest applications after demand from undersubscribed countries was satisfied. On the other hand, India remained under the per-country cap in FY18, so its 585 visas directly reflect the number of FY18 applicants (more than threefold increase from the previous year). But keep in mind, lengthy I-526 processing times mean that the FY18 surge in India visa applications reflects a surge in investments from India that happened 1-2 years ago. 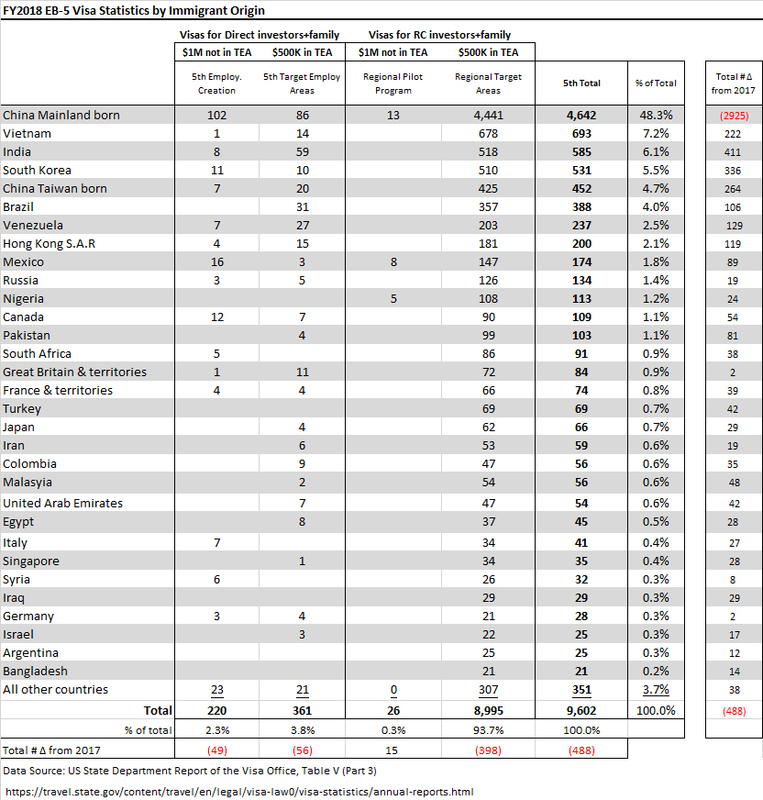 For a better sense of recent demand trends, see the log of pending I-526 by country and priority date that USCIS published in October 2018. I’ve expected to see an increasing number of visas associated with direct EB-5 investments, but that hasn’t been true so far. Regional center investments accounted for 94% of EB-5 visas issued in FY2018, as compared with 93% in FY2017 and 91% in FY2016. I haven’t had time yet to update and recalculate my backlog calculation spreadsheet. But I will add one table here as follow-up to ILW’s article EB-5 Industry Misunderstands Retrogression (12/31/2018). The article estimates that “India generated close to $500 million in EB5 investments in 2018, and it is on track to generate $1 Billion in 2019 and $2 Billion in 2020. Indian EB-5 is a $3 Billion opportunity in the coming two years.” The article goes on to rightly correct misconceptions about how EB-5 visa allocation works, but omits one important calculation: what happens if one puts $3 billion dollars (12,000+ visa applicants) from one country in line to a gate that can only issue about 700 visas annually. If we want to make Row A in that table a reality, and how wonderful that would be, then we have to deal with the constraints that turn successful markets into backlog tragedies. Let’s put the pressure on Congress for visa relief. Otherwise, ethical promoters will have no option but to reduce the amount of investment they try to raise, or to support proposals dramatically increasing the minimum investment per investor. As I-526 times improve, the many countries in the world with no visa wait (all but China, Vietnam, and (soon) India) will be able to enjoy EB-5 as a fast track once again. And project companies, investors, and program integrity all benefit from prompt attention by USCIS to investor petitions. Question 2: If I’m a Vietnam-born person with pending I-526 or pending visa application, how long can I expect to wait for EB-5 visa availability? This question has a better answer than many people fear. Last month when Charles Oppenheim of Department of State predicted a 7.2-year wait for Vietnam-born, he was giving a prediction for one point: people filing I-526 on October 30, 2018. If that point-in-time prediction is correct, then the wait time will be less than that for everyone who filed I-526 before October 30, 2018. 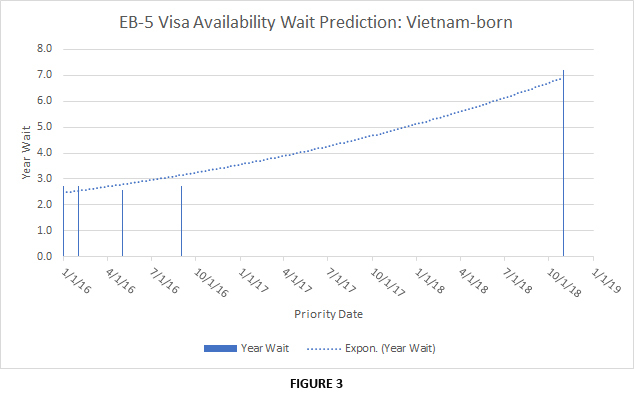 The blue columns in Figure 3 mark the data points we have: actual wait times for past applicants (calculated by subtracting Final Action Date from Visa Bulletin Date in past Visa Bulletins), and Oppenheim’s future predictions. Fit a trend line through those points, and you can estimate wait times for other priority dates, between the past actual and future predictions. (The trend won’t turn out neatly linear in real life, but I think this is good for a rough estimate. If you want a better trend line, you can factor in quarterly fluctuations in I-526 filing and approvals, and guidelines for allocating visas by quarter. Or you could push for legislative/administrative fixes that would change the picture entirely.) These charts and source data are in the “Vietnam Calc” tab of my Backlog calculation spreadsheet. Question 3: If I’m an India-born person with pending I-526 or pending visa application, can I expect to get a visa number in FY2019, before visas for India get used up for the year (i.e. before Department of State sets a Final Action Date for India)? 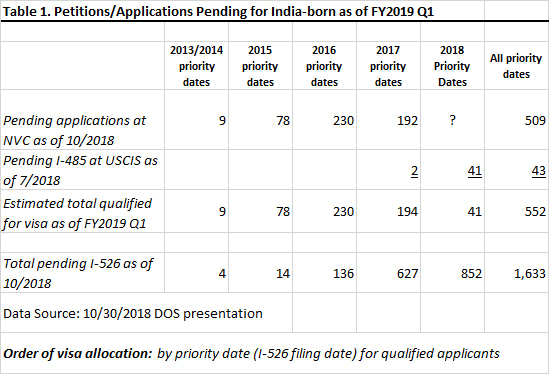 The worst case scenario is that in the next couple quarters, USCIS approves a lot of the I-526 pending for India-born people who filed I-526 in 2013-2017. If that happens (and the newly-approved petitioners quickly become documentarily qualified for a visa), the result could be that no one born in India who filed I-526 more recently will get a visa number in FY2019, no matter how quickly their I-526 was/will be processed or when they filed I-485 or the visa application. This risk exists because visa numbers get issued to qualified applicants in order by priority date, not based on when they filed their visa applications. The risk is accentuated by the fact that Charles Oppenheim at DOS is required by statute to dole out available visas gradually over the course of the fiscal year (no more than about 27% each quarter in the first three quarters), not all at once to as many people as qualify for them. That delay gives time for the pool of documentarily qualified applicants to grow, as USCIS approves more petitions. The best case scenario is that in the next couple quarters, the pool of India-born people qualified for a visa doesn’t grow much, and additions to the pool mainly consist of people who filed I-526 recently. In that case, everyone already qualified for a visa as of Q1 FY2019 (500+ people) could actually get a visa in FY2019. Plus a few more people (about 60 investors with their families) who will get I-526 approval and become documentarily qualified in FY2019 may also get allocated visas before the approx 700 visas available for FY2019 run out. The best case scenario is possible because expedited projects have been popular with Indians, USCIS can be slow to process older I-526 (and has a lot of older petitions in the backlog from countries besides India), and the process between I-526 approval and becoming documentarily qualified can also be very slow. 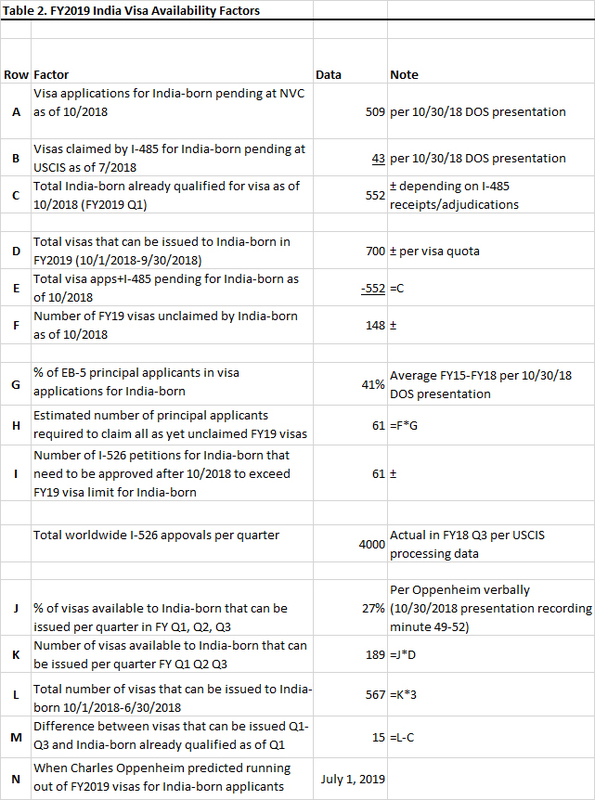 The facts in Table 1 and Table 2 suggest to me that an India-born person filing I-526 today is unlikely to get a visa number in FY2019, regardless of how quickly they can get I-526 approval and qualified for a visa. There are just so many older petitions and applications already in the system. I don’t have my life savings and family on the line, however. If you do have a major life decision depending on EB-5 timing, you should spend more time with the reports and spreadsheets to make your own estimate between the best and worst case possibilities. And talk with the immigration lawyer about limitations and benefits of being at various points in the process (I-526 pending, I-526 approved but not yet documentarily qualified, I-485 pending, documentarily qualified at NVC…) at the time when DOS publishes a Final Action Date for India. For anyone who doesn’t manage to get a visa number in FY2019, don’t be too discouraged. India will have a trend line, like Vietnam as discussed above. You don’t automatically wait 5.7 years for a visa by virtue of having been born in India. Your wait time will depend on your priority date, with dates before October 2018 promising shorter wait time. My post EB-5 Visa Waiting Line and Visa Allocation explains in more detail how visa allocation works. FYI, the Telegram group https://t.me/EB5VisaGroup notified me that they assembled their own India prediction spreadsheet. I’m not posting it here because I don’t know how to explain all their calculations and sources, but you can reach out to the group to request their additional analysis. To the extent that my analysis and reporting benefits your decision-making, please consider my PayPal contribution option (corrected link). My spreadsheets and posts take a lot of time and thought that can only be rewarded if others share their benefit. I hope the work helps my clients who need information, and an industry that needs transparency, but it’s a sacrifice for me personally as a service provider dependent on new EB-5 business. Ms. Kendall is a career civil servant and spoke accordingly. She gave the impression of being competent, in control, and unlikely to say anything unexpected. I didn’t note anything major in her speech that I hadn’t already heard from the USCIS Policy Manual, OMB Unified Agenda, or previous stakeholder meetings. (UPDATE: Here is a copy of Ms. Kendall’s prepared remarks.) The headlines: no update on regulations beyond what OMB said, and no significant new input on the hot issues of redeployment, bridge financing, material change, or minors as investors. Stakeholder meetings are not the proper venue for policy announcements, so I suppose there’s really not much to do but repeat existing guidance and say “thank you, we’ll consider it,” for everything else. One would expect Ms. Kendall to have a law enforcement orientation, considering her background. And indeed she stated that “focus must be on program integrity,” and listed these objectives for IPO: improve transparency, protect national security, lawful administration of our nation’s laws. I appreciate that she started with transparency, which is foundational to the other two objectives. And it was gracious of Ms. Kendall (and former Interim Chief Julia Harrison) to attend the AILA/IIUSA event and take time to chat with attendees. In the past I’ve sometimes felt like a lone crusader with my spreadsheets and numbers reports. I attended the AILA/IIUSA forum in person partly because I suspected that Charles Oppenheim would give information about visa numbers and wait times that my clients need to know, and no one else would process it or publicly report on it. But I was wrong. A wonderful panel on visa numbers not only provided a very extensive data set but analyzed and drew actionable conclusions from it, and then IIUSA made the right choice to promptly publish the full presentation where anyone can access it. And now other people are already reporting on it, without pausing to worry about messaging. Integrity depends on transparency – an important lesson for everyone. These time predictions refer to the time between I-526 filing and visa availability for people filing I-526 on October 30, 2018. 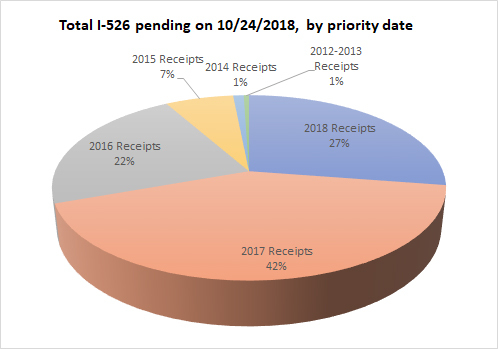 People who filed I-526 before October 30, 2018 have fewer people ahead of them in line, and thus can expect correspondingly shorter wait times. People who file later can probably expect longer waits (unless trends or rules change, as they could). The predicted visa wait times for South Korea, Taiwan, and Brazil are now short enough as to be likely imperceptible (i.e. even shorter than I-526 processing time). Mr. Oppenheim foresees that South Korea, Taiwan, and Brazil will remain current (no cut-off date) through 2019 and probably 2020. The predicted wait time for an India-born investor filing today has lengthened since the last prediction from April, but not as much as I’d feared. 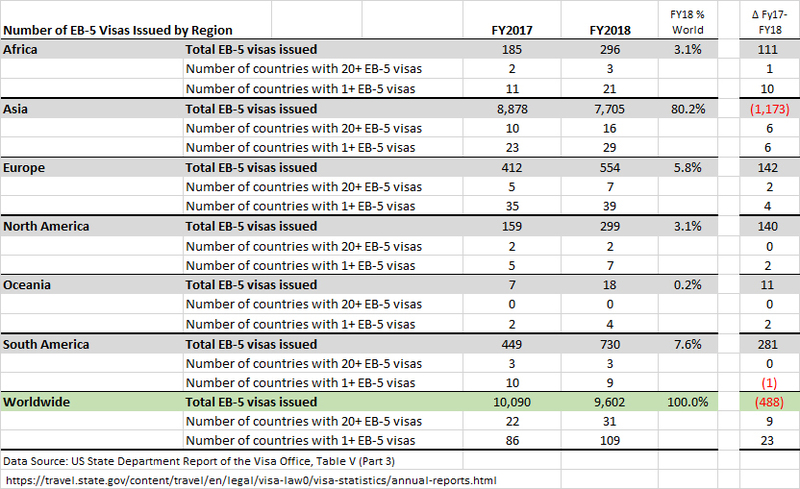 Mr. Oppenheim now predicts that the Visa Bulletin will have a Final Action Date for India “no later than July 2019.” In other words, the annual EB-5 visa allocation available to India in FY2019 is expected to run out in July. In October 2019, when new FY2020 visas become available, India will have a Final Action Date in 2017, meaning that India-born applicants with priority dates before the 2017 Final Action Date will then be able to apply for visas. As for China, Mr. Oppenheim predicts that by October 2018, the Final Action Data for China-born applicants will progress to 10/22/2014 (best case) or 10/8/2014 (worst case), and that China will advance (at best) two months in 2019. Mr. Oppenheim expects to be able to move Vietnam’s Final Action Date as far as September 2016 this year, before the FY2019 visas available to Vietnam run out. Wolfsdorf Rosenthal is holding a free webinar on 11/8 to discuss the DOS data and implications. Regarding legislation and potential developments in Washington, I did not hear anything particularly newsworthy. Industry lobbyists say that they see hope for the future because they are finally united for the first time. This talking point would be more encouraging if we hadn’t heard the same statement last year, before the last attempt at EB-5 legislation that excluded most of the industry until the 11th hour and then met with industry discord. The panel last week did not specify compromises or concessions that have been made since then, and did not reflect specifically on what went wrong. The panel foresaw possibility for renewed legislative efforts in 2019, initiated in the House. EB-5 has best chance of getting attention after border wall funding and DACA are no longer taking all available oxygen, and after more representatives have been educated on EB-5. The panel hinted that we might be looking at more continuing resolutions in December, particularly for DHS funding if Democrats do well in the midterms. The proposal to eliminate per-country caps (in the Yoder amendment to the House version of the DHS funding bill, and H.R.392) got little mention, and no one said they thought it likely to be enacted. Overall, IPO is receiving fewer forms and processing more forms than before. That should be a good sign for processing times at least, and will result in smaller backlogs. However, performance improvement is currently all focused on I-526. Q3 showed a record-breaking number of I-526 processed (22% improvement over the previous quarter) but drop in number of I-924 and I-829 processed. Q3 I-526 receipts were lower than any quarter I’ve recorded since 2013, likely reflecting concerns about visa wait time. In Q3, I-829 receipts exceeded I-526 receipts for possibly the first time ever. I-829 completion rates look terrible, with an almost-linear 65% drop in completions over the last four quarters. What’s happening, I-829 team? Why are you getting fewer and fewer I-829 adjudicated? IPO should put more resources on I-829 adjudication, considering the receipt trend across all forms. A surprising 51% of Form I-924 adjudicated in Q3 were denied. The denial rate for I-829 was higher than usual, at 13%. The I-526 denial rate remained at 9%. USCIS is not infallible when it comes to inconsistencies, and the Q3 reports contain significant revisions to the Q2 and Q1 numbers previously reported. In the I-829 reports, for example, the May report indicated 1,046 receipts in Q1, the July report indicated 694 receipts in Q1, and now the October report indicates 862 receipts in Q1. You make us doubt that you know what happened in with I-829 in Q1, USCIS! This should make USCIS recognize and sympathize with the difficulty of reporting consistent numbers, even with the best of intentions. FYI, here is my file on the ongoing mystery of the pending petition count. There’s an EB-5 Support page on the USCIS website that provides an email address for IPO, and instructions for how and when to communicate through the IPO mailbox. I’ve dismissed this contact option, having only heard and experienced reports that emailing the IPO mailbox yields nothing but a canned response and no action. But what do you know, sometimes it works. On October 25, 2018, IPO responded to an email from one of my readers with this extremely valuable information: “Shortly after replying to your email, Immigrant Investor Program Office management asked the webmaster to post online a table containing I-526 data. 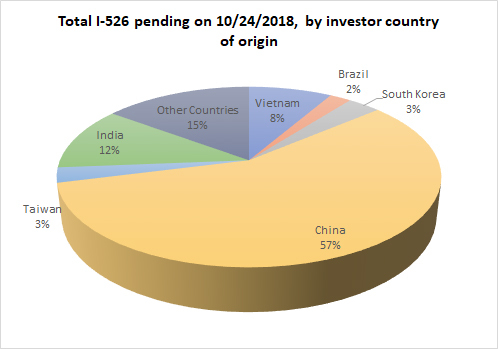 Here’s the link: https://www.uscis.gov/sites/default/files/USCIS/Working%20in%20the%20US/i526list.pdf” The link leads to a table that breaks down all I-526 pending at IPO as of October 2018 by investor country of origin and priority date. Thank you IPO management for this transparency! Program integrity depends on informed decisions, which in turn depend on information. We understand that these figures are probably subject to change since they’re so recent, and haven’t gone through the months-long review process that normally precedes public data posting. That’s just fine — our decisions need data timeliness far more than minute precision. And thank you reader for making the request and for bringing the answer to public attention. Otherwise this data treasure might have rested unnoticed on the USCIS website, or been hoarded by a few. The charts and tables below highlight features of the data that I consider particularly interesting. 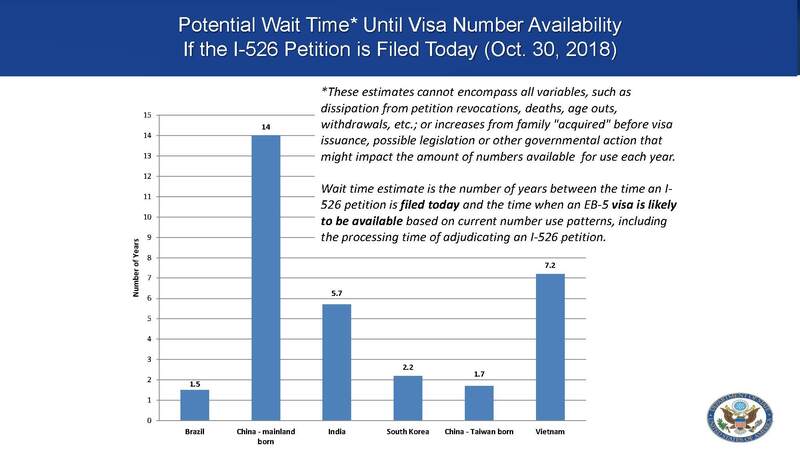 The pending I-526 numbers by country help explain why Department of State predicts backlogs and visa wait times for certain countries. The pending I-526 numbers by receipt date illustrate how long currently-pending petitions have been waiting for adjudication. And the figure for total pending petitions, combined with data from other sources, suggests that I-526 receipts may have plummeted in FY2018. That’s bad news for the US economy, job creation, and destitute business plan writers like me whose revenue depends on new EB-5 demand. But it’s good news for EB-5 program sustainability. So long as the EB-5 visa cap remains at about ten thousand for investors plus family, the program can unfortunately only sustainably accommodate three to four thousand investor I-526 per year on average. I’ve added the data from USCIS to the I-526 tab and Country Focus tab of my Backlog spreadsheet.